Last week, Holland America Line announced that, after an absence of two seasons from the Bermuda trade, it would be returning with its Veendam, starting in May 2015. Unlike all the other contract ships sailing to Bermuda, the Veendam can dock right on Front Street in Hamilton. This decision would appear to be a result of two things: the recent legalization of gambling on ships docked in Bermuda and a change in the North American ECA regulations that will see the maximum sulphur content reduced from 1% to 0.1% for fuels burned within 200 miles of the North American coast. In other news the Queen Mary 2 celebrates ten years in service this year while the world’s largest cruise ship, Allure of the Seas, will come to Europe for a full season in 2015. 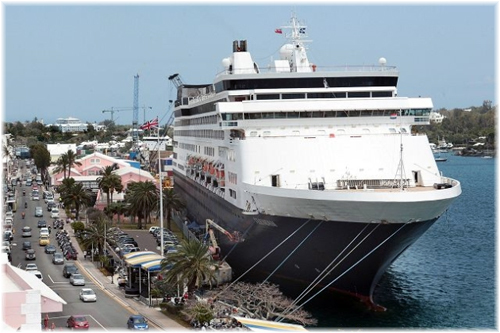 Last week came good news from Holland America Line for the merchants of Front Street in Bermuda, when it was revealed that the 57,092-ton Veendam will return to Bermuda in 2015. So far sailings have been scheduled for May 2, 9 & 30, June 6 & 27 and July 4, although more could follow for both 2015 and 2016. Unlike her previous service to Bermuda, however, these will be 7-night Saturday sailings from Boston rather than from New York. Until 2012, the 1,348-berth Veendam had been regularly engaged on the New York-Bermuda run but late that year she was reassigned to Canada/New England cruises between Boston and Quebec. She entered that trade in rthe autumn of 2012 and returned for a full summer season in 2013 and will do another this year. Part of her move from Bermuda to the St Lawrence trade involved incentives of $1.15 million to be paid to Holland America Line over three years by the Province of Quebec and City of Quebec. How this new deployment will affect the St Lawrence trade is not yet known but Holland America Line gains two clear advantages by sending the Veendam back to Bermuda. Firstly, Bermuda has now passed legislation that allows cruise operators to keep their casinos open from 9 pm until 5 am, which in turn allows their ships to profit from additional on board spend while in port. This regulation had indeed been one of the reasons that had impelled Holland America not to renew its Bermuda contract in 2012. The other is that under the regulations of the new (2012) North American Emission Control Area (ECA), it will be possible for the Veendam to burn less expensive fuel with a heavier sulphur content while running from Boston to Bermuda. 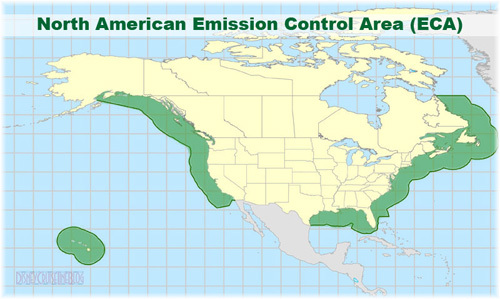 This is because effective August 1, 2015, the maximum sulphur limit will be lowered from 1% to 0.1% for fuel burned within 200 nautical miles of the coast of North America. The marine gas oil that will have to be used while steaming between Boston and Quebec is much more expensive than the heavier fuel that can be burnt while steaming beyond the 200-mile limit to Bermuda. Although price differences vary, for a vessel burning 100 tones per day a difference of $300 per ton would mean an extra $30,000 a day while steaming. Over 1,200 passengers this comes to an extra $25 per passenger per day on the ticket price. 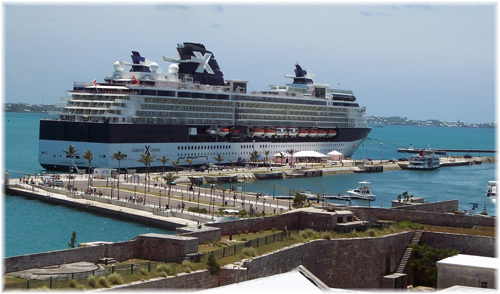 A third competitive advantage for the Veendam is that, unlike the other contract ships operated to Bermuda by Celebrity Cruises, Norwegian Cruise Line and Royal Caribbean international, the Veendam is small enough to steam straight into Hamilton, where she can dock right on Front Street in the capital’s main shopping and entertainment district. The bigger ships have to berth at Dockyard, a 45-minute taxi ride or a 30-minute ferry ride away from Hamilton. The increasing size of cruise ships has meant that Hamilton has had no regular caller since the Veendam left at the end of the 2012 season. Ships with the name Veendam have a long history with Bermuda, dating back more than eight decades. The first to serve Bermuda was the 15,450-ton Veendam, second of the name, built in 1922. She was chartered to the Furness Bermuda Line in 1930 for two summers’ work on the New York-Hamilton run. She used as a temporary replacement for Furness Bermuda’s 7,785-ton Fort Victoria, which had been sunk in a collision off New York in December 1929. This Veendam first left New York for Bermuda on July 2, 1930, and was engaged for two summer seasons until Furness Bermuda could take delivery of a new ship, the 22,424-ton Monarch of Bermuda, in January 1932. The second Veendam to serve Bermuda, and the third of that name, joined Holland America in 1973. This Veendam, at 23,372 tons, had been built in 1958 as Moore-McCormack Line’s Argentina and refitted as a cruise ship at Lloyd Werft in Bremerhaven in 1972. After some time sailing to Alaska for Westours, she began summer sailings to Bermuda on May 20, 1980. This Veendam would stay in the Bermuda summer trade until being sold at the end of 1983, and subsequently operated to Bermuda as the Bermuda Star for Bahama Cruise Line, later known as the Bermuda Star Line. The present, and fourth, Veendam, built in 1996 and third of the name to serve Bermuda, first came onto the run in 2009, and served four full summer seasons before being transferred to the Canada/New England trade at Boston in 2012. The new Boston-Bermuda cruises will therefore see a fourth return of the name Veendam to the Bermuda trade, in an association that will be eighty-five years old when she returns. Cunard Line’s Queen Mary 2 just last month celebrated ten full years on the Atlantic, for which she was designed, before departing on her present World Cruise. She is presently en route from Port Louis, Mauritius, to Australia, where she is due in Fremantle on Wednesday. 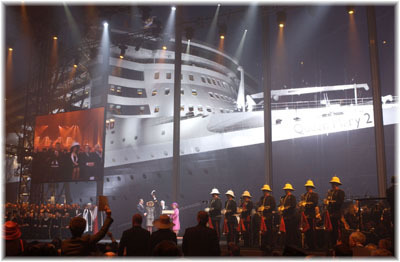 Since her naming by Her Majesty Queen Elizabeth II at Southampton on January 8, 2004, the most famous of ocean liners has completed 479 voyages. Of which more than 200 were Atlantic crossings. In that time, she has called at 182 ports in sixty countries and has traveled nearly 1.5 million nautical miles, carrying 1.3 million passengers in the process. The official 10th anniversary celebrations will begin on May 9, year when all three Cunard Queens will arrive together in their homeport of Southampton. Sister ships Queen Victoria and Queen Elizabeth will salute the company flagship’s first decade of service. The day will feature special sail-pasts, a celebration lunch and a spectacular send-off to fireworks as all three ships set sail together from Southampton waters that evening, with Queen Mary 2 in the lead. That same day, Queen Mary 2 will begin the first of two special commemorative crossings to and from New York (May 16), underlining her role as the only ocean liner in the world still to maintain scheduled service across the Atlantic. This is something that Cunard Line has now done since 1840, when its 648-ton Unicorn left Liverpool on May 16 for Halifax and Boston. The 1,150-ton Britannia, the first of four new Cunard ships that would ensure a fortnightly schedule, followed the Unicorn on July 4. 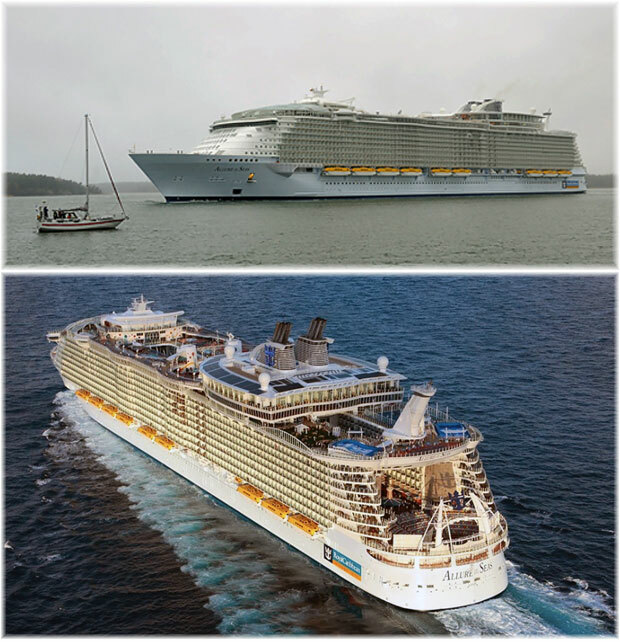 Last week, Royal Caribbean International announced that the 225,282-ton Allure of the Seas, the world’s largest cruise ship (by two inches over her sister ship Oasis of the Seas, which has the same tonnage) will be coming to Europe in 2015. Both ships have to come to Europe for their five-year drydockings, Oasis having been completed in 2009 and Allure in 2010. This will not be the first time that such a large ship has cruised from Europe, however, as the Oasis of the Seas will do a brief European season this summer before her own drydocking. Oasis of the Seas is offering a choice of three sailings including two 5-night round-trip Western Mediterranean cruises from Barcelona, and a 7-night itinerary from Barcelona to Rotterdam. The Oasis also offers two trans-Atlantic sailings, a 12-night crossing from Fort Lauderdale to Barcelona on September 1,and a 13-night voyage for Fort Lauderdale, which will embark passengers at Rotterdam on October 14 and at Southampton on October 15. Likewise, in 2015, the Allure will offer two Transatlantic sailings, details of which have yet to be announced but likely again from Fort Lauderdale to Barcelona and back from Rotterdam. From May 3 through October 2015, the 5,408-berth (6,318 with upper berths) Allure of the Seas will be based in Barcelona, where she will offer a summer-long series of 7-night cruises to Palma, Marseilles, La Spezia and Civitavecchia (for Rome). Civitavecchia will also be an embarkation port. 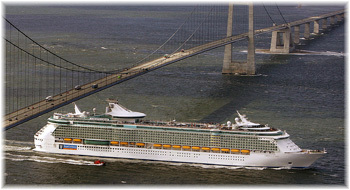 The itinerary is similar to that now operated by the 154,407-ton 3,634-berth (4,375 with upper berths) Liberty of the Seas. The main differences are that Palma will replace Villefranche as a port of call and the Liberty’s present call at Naples will not be picked up by the Allure of the seas. Although not yet announced, it appears the Allure will be replacing the Liberty of the Seas, Royal Caribbean’s regular Barcelona ship for the past few years. If that is the case, this will mean an increase of almost 50% in Royal Caribbean’s lower berth capacity from Barcelona.